Boris Groys (1947) emerged as one of the most significant art theorists of our time with his books Über das Neue (‘Confronting the New’) (Munich 1992) en Unter Verdacht (‘Under Suspicion’) (Munich 2000). Groys’s subject is avant-garde art from the East and West (he is of Russian origin, lives in Vienna and teaches in Karlsruhe). His central thesis is that the cult of the new, which typifies the twentieth century, is in fact a cult of the archive. After all, something can only be recognized and acknowledged as new if it distinguishes itself from all that is old, and the question of whether it does so can only be answered if an archive exists in which the old is to be found comprehensively and accessibly. In order to set itself out as new, avant-garde art rebels against this archive (the museum), but at the same time attempts to be included in the archive, for if it is not, it will be forgotten. In order to be allowed into the archive, new art must create the impression that it is the symbol of a completely unknown cultural domain existing outside the archive. This symbolic reference to a profane world of infinite possibilities outside the archive guarantees the new ­artwork its sacred position within the museum. 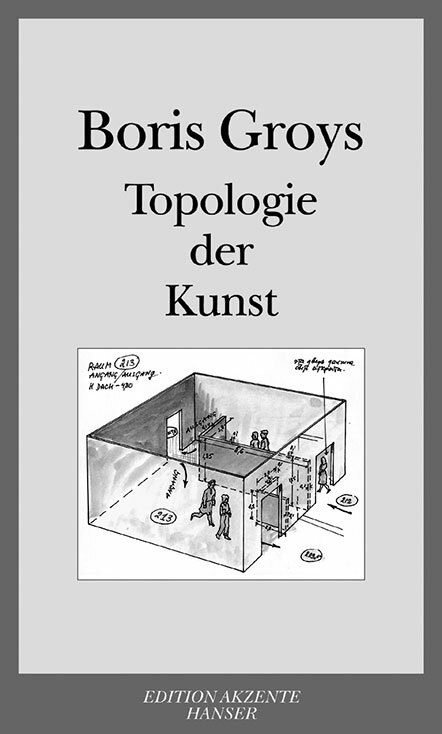 In his new collection of essays, Topologie der Kunst (‘The Topology of Art’) (2003), Groys examines how the dialectic of old and new is functioning at the start of the twenty-first century. The ‘topology’ in the title refers to the place of art in the archive: it is only recognizable as art if it stands in an art context; outside of this is often literally refuse. The essays rather overlap one another, are sometimes a little too clever and in effect contain the material out of which Groys should have written a nice coherent dissertation. He evidently did not have the time. I shall try to supply a summary of this unwritten book. Twentieth-century art was about the media with which this art was made: the poem was a monument to language, the painting a monument to paint and ­canvas, music a monument to a system of notes. The artist wanted to make his medium speak, show, ring. He was no longer interested in communicating something he had only discovered within himself and yearned to share with others, or in something he had disco­vered in others and wanted to bring to light via himself; no, the twentieth-century (post)modernist artist wanted to be the medium of his medium. But, to quote Groys, ‘when the avant-garde artist forgoes his own, particular, individual message, he abandons the domain of everyday, peaceful communication.’ To express an opinion means to acknowledge that other opinions, in principle, have an equal right to exist, but he who instead represents the medium that makes it possible to have opinions in the first place, who speaks in the name of his medium itself, is no longer capable of an exchange of views. Such a person cannot exchange his medium for another, better or more practical medium, for then he would be left with nothing. This type of artist can only remain true to his medium or betray it. Anything and anyone who did not agree with a twentieth-century artist must, in his view, be ­annihilated. As a consequence, twentieth-century avant-garde art was aggressive, destructive, implacable and totalitarian in nature, both in its manifestation and in its dealings with art forms that wanted to be about some­thing else. Now that the twentieth century is behind us and that it is slowly but surely becoming a puzzle what people got so excited over in that period, we are left with museums full of stultifying, myopic, uninteresting art: the glorious legacy that has become the permanent collection of museums of contemporary art. However, a counter-movement of artists has emerged, who want to introduce something cheerful and lively into the museum again, and therefore present photographs, films and videos, which almost by definition are about something other than themselves. Once allowed into the museum (as a collective term for the whole art world, including galleries, biennales, temporary exhibitions, art journals, press reviews, etc.) this counter-movement is faced with the disconcerting fact that it cannot function any differently within the museum than did the twentieth-century art that preceded it: it can only be about itself. If films and videos are only about themselves, what sort of new insights do they generate? This: classical visual art does not move, but it sets its audience in motion, while technical visual art moves, but brings its audience to a standstill. You view paintings walking around; you view films sitting down. But because in the museum you do not have to stay seated, as in the cinema, you never watch the art films and videos all the way through, and so you never know whether you have genuinely and completely seen the work. You might have missed the ­essential moment, or you were unlucky enough to have caught a dull passage. In the museum, the only interesting videos and films are those that address the theme of this dialectic of seeing and non-seeing. To us humans, something is only real when we not only receive it or purchase it, but also give some­thing in return. The ‘symbolic exchange’ Marcel Mauss wrote of in his essay Sur le don (‘The Gift’) (1924) forms the basis of our perception of reality. In the domain of the museum the exchange between artwork and audience has been severed by the avant-garde for a century. Autonomous art is art that can only be viewed, admired and possibly internalized; it is complete in itself; it does not need the gaze of the audience but does demand the total dedication of its spectators. Because no symbolic exchange with autonomous art is possible, it cannot become real for the viewer. For this reason, contemporary works of art in the last 30 or 40 years came increasingly to be experienced as ‘simulations’, as objects that had lost their real value and could only be consumed. Consumption is a one-sided appropriation. The symbol of this artistic consumerism was ready-made art, which Marcel Duchamp first presented with his urinal. According to Groys, art, from that point on, operates in this way: the artist consumes reality, because he picks out what he likes and presents this as his work. The curator then consumes the artists’ supply and picks out what he likes. The art public finally consumes the curators exhibitions and picks out what it finds pleasing, exciting or interesting. Nothing more is at stake. There’s no accounting for taste: exit art criticism. Now, photographs, film and video are quintessentially ready-mades: just turn the camera on and your work of art is almost complete (Duchamp’s ready-made is familiar to us because he had it photographed). Artists who still work with traditional methods and create something drawn from within themselves are considered, if not pathetic, at least a little suspect. Why fuss so long with it? Did they not know what they wanted? Groys: ‘The first word that comes to mind when you think of culture at the moment is the word “financing”.’ This is how you make art these days: you write a research proposal; if this is deemed worthy of sponsoring or subsidy, you go ahead with it; if it is not approved you abandon it. The only standard by which the quality of art can be expressed anymore is money: how much does it cost, how much will it make? You cannot tell from the artwork itself whether it is worth anything, since anything can be art once it has entered the museum. Art lovers have developed the amazing capacity to say that they would not mind having a work at 2000 Euro, but not at 2500 Euro (even when they are not planning to buy it). The subjective, inner perception of art has also become an inner, subjective perception of money. The dividing line between low and high art is that the former is meant for the mass market and the latter for specific niche markets. Money is not a medium like language: now that language is at a loss for words when it comes to art, the medium of money still works fine. The tone of Groys’s new ­collection of essays is grumbling. I cannot escape the impression that contemporary art has not managed to reach the level of its most astute theorist, who therefore must turn out lesser work than he is capable of. Which elicits resentment in him, as he frankly admits in the last pages of the book. At one point he sighs, after yet another remark about something tiresome about art: ‘Es ist, wie es ist.’ (‘It is the way it is.’) When Groys describes his reaction to foreign cities and observes that the tourist gaze makes everything in a city monumental, he summarizes the experience thus: ‘Even when you go to New York and drive through the South Bronx and see drug dealers shooting each other or at least looking like they might shoot each other at any moment, such a scene attains the rank of the monumental. You think: “Yes, it has always been this way and it will always be this way”.’ This leads to a disappointment when, during a subsequent visit, the neighbourhood turns out to have been cleaned up and the drug dealers have disappeared: you perceive this as though a piece of authentic, unique, different life had been destroyed. This tourist gaze of ‘it has always been this way and will always be this way’ is characteristic of Groys’s view of contemporary art. It cannot be changed. You can only enjoy it as a tourist or be irritated by it. Arjen Mulder (NL) is a biologist and essayist, associated with the V2_Institute for Unstable Media in Rotterdam and the course for a masters degree in Editorial Design at the Utrecht College of Art. His recent books include: Over mediatheorie: woord, beeld, geluid, gedrag [On media theory: word, image, sound, behaviour] (2004) and De vrouw voor wie Cesare Pavese zelfmoord pleegde [The woman for whom Cesare Pavese committed suicide] (2005).